So the other question that comes up is how to control weeds between the rows and again, I don't have a silver bullet, but there are certainly more options! The first thing that I would tell you is I do not recommend applying any of these materials broadcast over the top of your mulch before planting! I think you are taking a risk that even after a couple of rains, some of the herbicide may remain on the plastic and could concentrate in the planting hole after you've planted with a rain - especially in cases where beds are not uniformly full and you have dips in your beds where water can gather on the plastic. 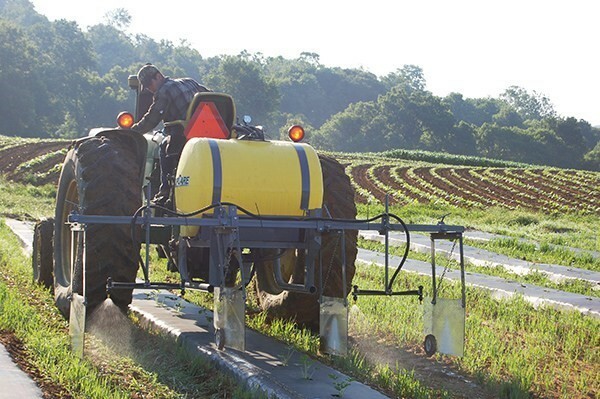 I think the best method is to fit the field, lay your plastic and then using either very directed sprays or better yet, a shielded sprayer, apply the herbicides between the beds, just letting the spray contact the shoulders of the bed. I've seen some homemade shielded units made from plastic totes to old wooden apple crates! My rule of thumb for row middle applications is, if the material is labeled on the crop, then it can be used in the row middles too unless otherwise specified on the label that it cannot be used between the rows. Using a pre-emergent or combination of pre-emergents before transplanting is the best strategy in my mind as you minimize the risk of drift and hitting your crop. However, if you can't get right in there to apply them after laying your mulch or planting and weeds are already starting to grow, I would recommend tank mixing in a contact herbicide such as Gramoxone (or other formulations of the active ingredient paraquat) to your pre-emergent materials as a shielded, directed spray. Why paraquat instead of glyphosate (Round-Up etc.)? Paraquat will only kill what it comes in contact with (so coverage is essential). So if a little drift moves onto your plant, it will only kill the area that it comes in contact with and leave some tan spots. Whereas a small amount of glyphosate will translocate and potentially kill or really hurt your crop and I'd rather be safe than sorry. Below is a list of some herbicides that could be used between rows of plastic mulch on various crops. This is not to be used in place of a label as in some instances a product may be labeled on some but not all crops in the same family (for example when I say brassicas, that includes cabbage, broccoli, etc., but these products may not be labeled on all members of the brassica family so please read the label before using). 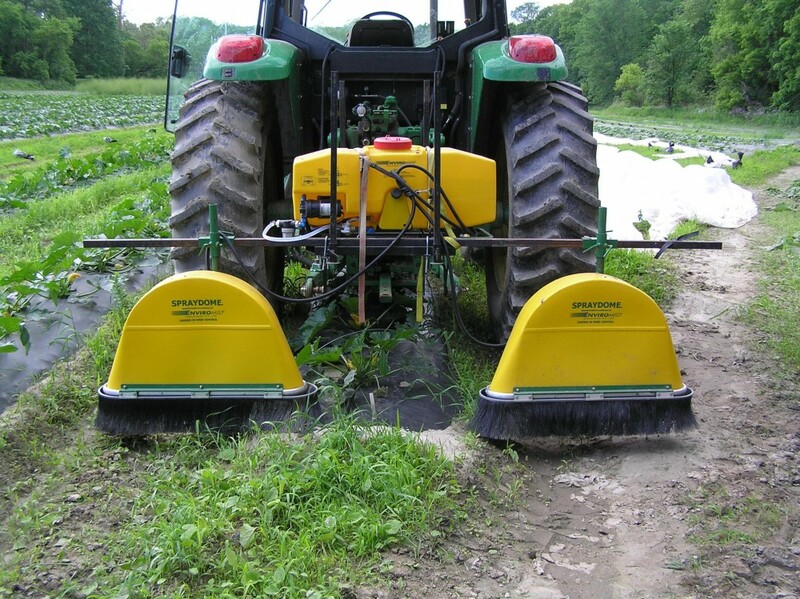 Hooded sprayer manufactured by Micron Sprayers Ltd and Enviromist Industries Pty.